It’s been a while we wanted to try La Bergamote in Chelsea, passing by many times, but thinking that it was a small place that served pastries, until we looked for a brunch place and stumbled upon it on Opentable. I had no idea that they have a small dining room in the back. So here we are, with Jodi’s cousin Rebecca, on Labour Day, a quite toasty day for sure, hungry as usual. Opened back in 1998 by two Frenchmen, Stephane Willemin, the executive pastry chef, and Romain Lamaze, the managing director, serve quite a classic brunch with French dishes that stand out like the moules frites or the ratatouille omelette, ratatouille being some sort of peasant dish, that became popular thanks to the Disney movie, but is quite a comforting dish, each family having its own way to make it (I’ll soon post my own recipe that I am working on right now, remembering the one my mom cooked when I was a kid). 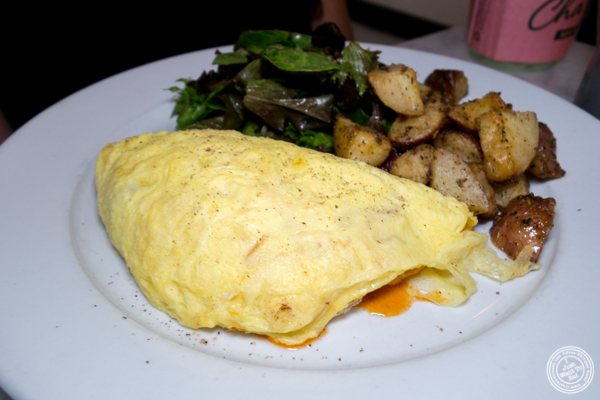 Only things is that, like many restaurants, omelettes or scrambled eggs fall short in whatever they fill or complement them with. Not enough ratatouille and not enough wild mushrooms in the wild mushroom scrambled eggs that Jodi ate. Don’t get me wrong: they were good but you would probably not come back for that. No, what you would probably come back for is the croque-monsieur, that has tons of cheese smothering the thin slice of black ham squeezed between a delicious brioche. This is a wow moment of you love cheese and I am glad that they are serving it with greens as fries or potatoes (that are quite good), would be too much. The other items that cannot be missed there are the pastries: they have a nice selection and we tried their Napoleon, that, although not classic with its raspberries, was pretty good. But the one I was really looking forward to try was their strawberry tart that is nice, with whole strawberries and a crumbly crust.